The aim of this contribution is to test the possibility of the use of cosmological principles connected with Etruscan religion, for composing an inscription which is incised on the wall of a passageway running beneath a ramp attached to the northeast side of the Tumulus of the Crosses, in the Banditaccia necropolis at Cerveteri. The ramp features a stairway leading to a flat ceremonial platform. On the basis of the letterforms the inscription may be dated to the end of the seventh or the beginning of the sixth century BCE. It is a rare example of a monumental inscription of the Orientalizing period of Etruscan Civilization. Directly beneath the inscription is a sign (siglum) formed by a cross inscribed in a circle. This sign has been recognized as the representation of the Etruscan concept of sacred space, whose crucial attributes are delimitation, division and orientation. A recent new reading of the inscription points out four theonymic elements, which recall divinities that, in the Etruscan cosmology, it may be argued, occupied the northeastern quadrant of the sky. Any amplification of this recent new reading must take into account interdisciplinary research focused on a possible relationship, in the field of archaeoastronomy, between the theonymic elements and the physical space that they occupy on the wall of the passageway, since the ramp is a crucial element of Etruscan funerary cultic practices. 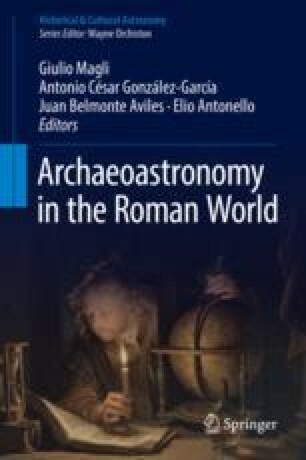 I am grateful to Giulio Magli for the opportunity to discuss this case study, which could open the way to comparing material evidence with a number of intangible aspects described by ancient literary sources concerning Etruscan cosmology, in terms of space and landscape.